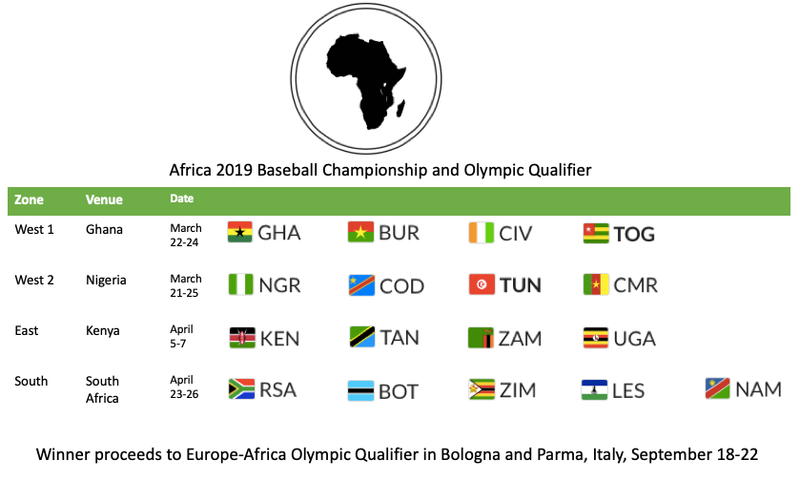 In March and April 2019 four regional qualifiers will be played in Africa with the winners advancing to the Africa Baseball Championship from May 1 to 5 in Johannesburg, South Africa. The winner of the continental championship will advance to the Europe-Africa Olympic Qualifier, which will be played from September 18 to 22 in Bologna and Parma, Italy. It will be the fourth Africa Baseball Championship after 1999, 2003 and 2007. A total of 17 countries have been invited to the regional qualifiers. For more information read here at Extra Innings.